You will feel right quiete at home! 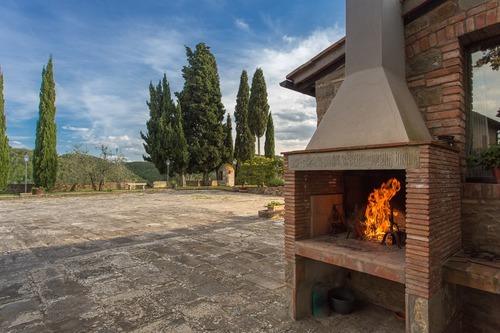 Recent restoration sought to preserve the original structure while bearing in mind the needs of our guests, who will find here all the comforts they need for an authentic experience of rural Tuscan life among the Chianti hills and cities of art, but also the facilities of a modern home. 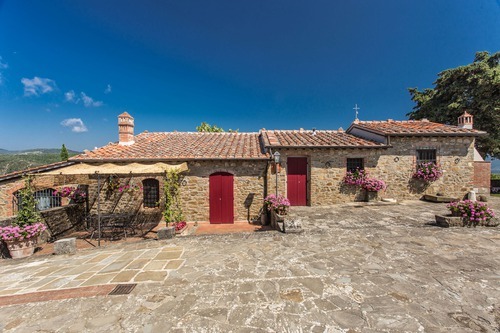 The property, enclosed by stone walls, consists of two buildings: the main farmhouse (Villa Marta), with the living area on the ground floor and 5 bedrooms upstairs, and the adjacent ground floor annex (Annex), with two bedrooms. It is therefore able to accommodate groups of up to 12 people. There is also a private swimming pool reserved exclusively for our guests' use, provided with sun beds and beach umbrellas. Poggio del Fattore is rented to one group at a time, as we intend to guarantee to our guests privacy, but also a familiar environment. In our opinion, this goal can be achieved only if the family we host can have all the property and its facilities for its own. For the same reasons, the Annex is only available for rent together with the main building, Villa Marta. Poggio del Fattore is open from April to November. We rent the entire property on a weekly basis from Saturday to Saturday (check in:3pm; check out:10 pm). Limited variations are possible, in accordance with other bookings and availabilities. The prices vary depending on the number of people and on the period of the year. For more information, please use the form or send an email to info@poggiodelfattore.com or contact us by phone. Links and buttons below, next to the contacts! Within the outer walls enclosing the Villa and Annexe you will find a friendly, welcoming environment.